From 1.4. to 30.6. and 16.9. to 30.10. discounts are possible for longer stays. From 1.11. to 31.3. on stays of two weeks or more: 30.-- EUR per night plus electricity. 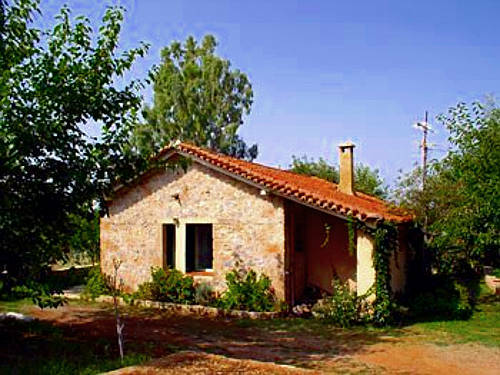 The typically stone builded so called "Bungalow" is quietly located within the village of Stoupa, nevertheless not even 100 meters away from the main beach. You'll have your own parking right beside the house and on the big Veranda surrounding the house you will find at any time of the day a shady spot. Even though the house is located in the middle of the village, you won't feel 'watched' as there is a large terrain with trees around it. It has a spacious living room with a charming fireplace. Outside both entrances, there are shady verandas surrounded by a garden to eat or rest. It has 2 bedrooms and it is equipped with lovely furniture including fans, stereo, TV and washing machine. It is fully furnished, including a complete kitchen and linen. It can sleep up to 5 adults. Ideal also for a stay during winter time!